Here we are at the great forge (Fig. 1), that wonderful creation which has not its like in France, that gigantic construction which iron has wholly paid for, and which covers a space of twenty-four acres. We first remark two puddling halls, each of which contains 50 furnaces and 9 steam hammers. It is in these furnaces that the iron is puddled. The ball or bloom thus obtained is afterward taken to the hammer, which crushes it and expels the scoriæ. The puddler's trade, which is without doubt the most laborious one in metallurgy, will surely soon be lightened through the use of steam. Two rotary furnaces actuated by this agent have been in operation for a few years at Creusot, and each is yielding 20 tons of iron per day. We have but a court of 130 feet in width to cross in order to reach the rolling mill. At the entrance to this we enjoy one of the most beautiful sights that the immense works can offer. For a length of 1,240 feet we perceive on one side a series of rolling machines, and on the other a row of reverberatory furnaces that occasionally give out a dazzling light. In the intervals are fiery blocks that are being taken to the rolling machines, in order to be given the most diverse forms, according to the requirements of commerce. The iron obtained by puddling is not as yet in its definite state, but the rolling mill completes what the puddling hall does in the rough. Five hundred and fifty thousand tons of iron, all shaped, are taken from the forge every day. To reach such a result it requires no less than 3,000 workmen and a motive power of 7,000 horses. But do not be appalled at the cost of the coal, for, thanks to ingenious processes, the heat lost from the furnaces nearly suffices to run the boilers. If we remark that a power of one horse does in one hour the equivalent of a man's labor per day, we conclude that these machines (which run night and day) represent an army of 160,000 men that lends its gratuitous aid to the workmen of the forge. This is what is called progress in industry. We have just seen that iron is obtained in small masses. These can be welded upon heating them to 1,500 or 2,000 degrees. It is impossible to manufacture a large piece exempt from danger from the weldings. Cast iron always has defects that are inherent to its nature, and these are all the more dangerous in that they are hidden. Steel is exempt from these defects, and, moreover, whatever be the size of the ingot, its homogeneousness is perfect. This is what has given the idea of manufacturing from it enormous marine engines and those gigantic guns that the genius of destruction has long coveted. Ah, if the good sense of men does not suffice to put a limit to their increasing progress, bridges, viaducts, and tunnels will take it upon themselves, if need be, to bar their passage. But, in order to forge large ingots, it became necessary before all to increase the power of the steam hammer. 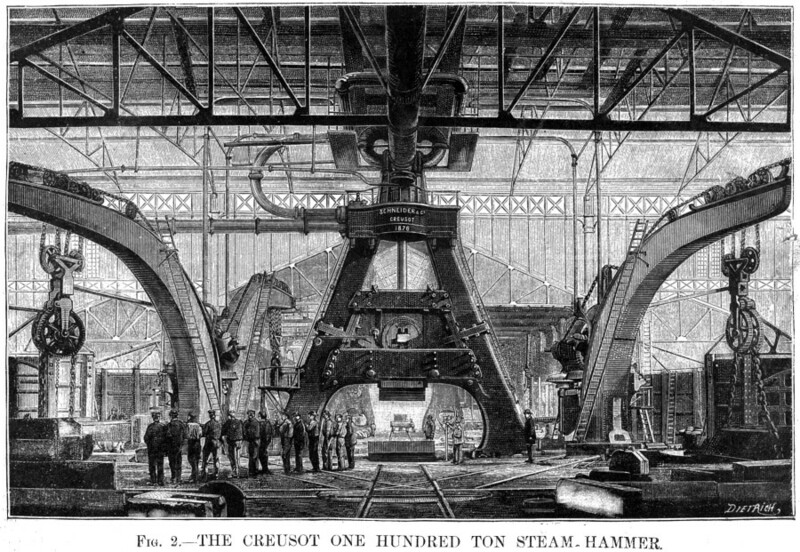 The Creusot establishment, which endowed metallurgy with this valuable machine, had allowed itself to be eclipsed, not by the number (for it had 57), but by the dimensions of the largest one. In 1875, the Krupp works constructed one of 50 tons, and their example was followed at Perm, St. Petersburg, and Woolwich. It was then that Mr. Henry Schneider put in execution a bold project that he had studied with his father, that of constructing a 100 ton steam hammer, along with the gigantic accessories necessary (Fig. 2). It became necessary to erect a building apart for its reception. This structure covers a surface of one and three-quarter roods, and reaches a height of 98 feet in the center. As for the hammer, imagine uprights 25 feet in height, having the shape of the letter A, surmounted with a cylinder 19½ feet in length and of a section of 3½ square yards. The piston which moves in this cylinder, under a pressure of 5 atmospheres, is capable of lifting a weight of 100 tons. The hammer, which is fixed to this piston by a rod, has therefore an ascensional force of 88,000 pounds. It can be raised 16 feet above the anvil, and this gives it a power three and a third times greater than that of the Prussian hammer. Large guns can therefore be made in France just as well as in Germany. This enormous mass is balanced in space at the will of one man, who, by means of a lever, opens and closes two valves without the least effort. This colossal hammer required an anvil worthy of it. This weighs 720 tons, and rests upon granite in the center of 196 feet of masonry. The hammer is surrounded with four furnaces heated by gas, and duty is done for each of these by steam cranes capable of lifting 350,000 pounds. These cranes take the glowing block from the furnace, place it upon the anvil, and turn it over on every side at the will of the foreman. Under this hammer a cannon is forged as if it were a mere bolt. The piece is merely rough-shaped upon the anvil, and a metallic car running upon a 36 foot track carries it to the adjusting shop. There the cannon is turned, bored, and rifled, and nothing remains but to temper it, that is to say, to plunge it into a bath after it has been heated white hot. For this purpose an enormous ditch has been dug in which there is a cylindrical furnace, and alongside of it there is a well of oil. The car brings the cannon to the edge of the ditch, and a steam crane performs the operation of tempering with as much ease as we would temper a knife blade. In the presence of such engines of attack it was necessary to think of defense. The hammer that forges the cannon also gives us the armor plate to brave it. This time the ingot is flattened under the blows of the hammer, and even takes the rounded form of the stern, if it be so desired. Thus is obtained the wall of steel that we wish. Will it be possible to keep up the fight long? In order that one may get some idea of this for himself, let us rapidly describe an entirely peaceful contest that took place recently upon the coast of Italy. Two rival plates, one of them English and the other French, were placed in the presence of the Spezia gun, which weighs 100 tons. These plates were strongly braced with planks and old armor plate. Three shots were to be fired at each of the plates. In the first shot the ball was of hardened cast iron, and weighed 1,990 pounds. The English plate was filled with fissures, while the Creusot did not show a single one. The ball penetrated it about seven inches, and was broken into small pieces. In the second shot the projectile was the same, but the charge was greater. The shot may be calculated from the velocity, which was 1,530 feet. It was equal to what the great hammer would give were it to fall from a height of a hundred yards. The English plate was completely shivered, while the French exhibited but six very fine fissures radiating from the point struck. The ball entered 8 inches, and was broken as in the first experiment. The third shot fired was with a steel ball, against the French plate, the English being hors de combat. The penetration was the same; the ball was not broken, but was flattened at the point like the head of a bolt. We should like to speak of those magnificent workshops in which the immense naval pieces are adjusted, where the shafts of helixes 60 feet in length are turned, and of the boiler works, where one may see generators that have a heating surface exceeding 2,000 square feet, for it requires no less than that to supply 8,000 H.P., and thus triumph over the force of inertia and those colossal iron-clads. But how describe in a magazine article what the eye cannot take in in a day? Despite all our regrets, we have to pass over some things, but our duty will not have been performed if we omit the history of the works. Creusot, which to-day is a regularly-built city with a population of 28,000 souls, was in 1782 but a poor hamlet called Charbonniere. The existence there of a coal bed had long been known, and iron ore had been found not far off. But how establish works in a locality deprived of a water course, and distant from the large ways of communication? In 1782 the steam engine, which Watt had just finally improved, removed the first difficulty, and the second was soon to disappear, thanks to a projected canal. An iron foundry was then established there under the patronage of Louis XIV., while the Queen had glassworks erected. As long as the war lasted the foundry supported itself through casting cannons and balls, but after the year 1815 it became necessary either to transform the works or sell them. It was decided to do the latter. The Messrs. Chagot, who became purchasers in the sum of $180,000, were in turn obliged to sell out in 1826. Creusot was then ceded to Messrs. Manby & Wilson, who already had works at Charenton. At the end of seven years of efforts this firm made a failure, and, finally, in 1836, after six million dollars had been swallowed up, Creusot was bought for $536,000, by Messrs. Adolphe & Eugene Schneider & Co. The period of reverses was at an end, and one of continued success was begun. The new managers had seen that carriage by steam was soon to follow, and open up to metallurgy an entirely new horizon. The works were quickly transformed and enlarged, and in 1838, the first French locomotive was turned out of them. After locomotives came steamboats. It was then that the necessity of forging large pieces gave the idea of a steam hammer. By a coincidence that can only be explained by the needs of the epoch, the English came upon the same discovery almost at the same time, and the Creusot patent antedated the English one by only two months. Two years afterward, frigates such as the Labrador, Orenoque, Albatros, etc., of 450 H.P., were rivaling English vessels on the ocean. After the death of Mr. Adolphe Schneider, on the 3d of August, 1845, his brother Eugene, left sole manager, displayed an activity that it would be difficult to exceed. He made himself familiar with the resources and productions of foreign countries and of France, and then made up his mind what to do. He desired to make his works the finest in the world, and it has been seen from what precedes that, after twenty years of effort, his aim has been attained. What a rapid progress for so short a time! In 1838, the first locomotive that was not of English origin appeared to us like a true phenomenon; a few years afterward the Creusot locomotives were crossing the Channel in order to roll proudly over the railways of a rival nation. A general, no matter how skillful, could not conquer with an undisciplined army, so the education of the workmen's children was one of the things that the founder of this great industrial center had constantly in mind. Mr. H. Schneider has continued the work of his father, and has considerably extended it, at Creusot as well as in the annexed establishments. The number of pupils who frequent the schools exceeded 6,000 in 1878. The work is not confined to educating the children, but a retreat is afforded the parents, without putting them under any restraint. After twenty-five years' service a workman receives an income of $100 if he is a bachelor, and $150 if married, but upon one condition, however, and that is that he is a Frenchman. For $1.20 a month he is lodged in a pretty little house surrounded with a garden, and, if he is sick, he is attended gratuitously. These benefits are not addressed to ingrates, as was proved by the profound sorrow that reigned in the little city when the death of the benefactor of Creusot was learned. 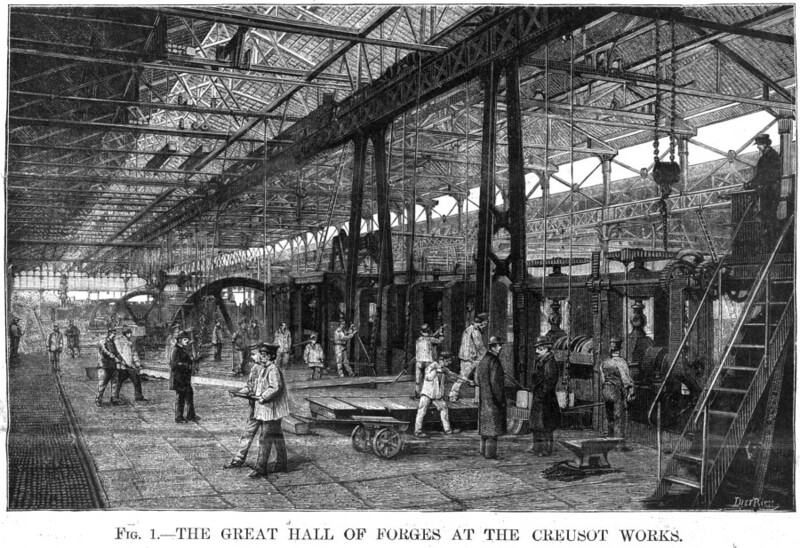 The members of the American Gun Foundry Board visited these works in 1883, and give the following in their report: The most important steel works in France are situated at Le Creusot, and bear the name of the location in which they are situated. These works have advanced year by year in importance and in magnitude since their purchase by Mr. Eugene Schneider. This gentleman's death, in 1875, was a source of mourning to the whole town, the inhabitants of which looked up to him as a father. The grateful people have erected to his memory a monument in the market square. Under the administration of his son, Mr. Henry Schneider, the fame of the products of the works has been enhanced, and the proportions of the establishment have been much increased. The whole number of workmen now employed here and at other points amounts to 15,000; and it is the great center of industry of the adjoining region. At no other place in the world is steel handled in such masses. It would be foreign to the purpose of this report to dwell on the many objects of commerce which are supplied from these works, but it is safe to say that no proposed work can be of such magnitude as to exceed the resources of the establishment. For the preparation of metal for cannon and armor-plates Le Creusot is thoroughly equipped. The iron is produced on the premises from the purest imported ores, and the manufacture of the steel is carried on by the most approved application of the open-hearth system with the Siemens furnace; the chemical and mechanical tests are such as to satisfy the most exacting demands of careful government officials; and the executive ability apparent in all the departments and the evident condition of discipline that pervades the whole establishment inspire confidence in the productions of the labor. The capacity for casting steel is represented by seven open-hearth furnaces of 18 tons each, equal to 126 tons; and the process of casting large ingots is a model of order and security. Ladles capable of holding the contents of one furnace, mounted upon platform cars, are successively filled at a previously determined interval of time and run on railways to a convenient position over the mould; before the first ladle is exhausted the supply from the succeeding one has commenced to run, and so on to the completion of the casting, the supply to the mould being uninterrupted during the entire process. The precision with which the several ladles are brought into position in succession makes it entirely unnecessary to provide a common reservoir into which all the furnaces may discharge. By this process the casting of a 45 ton ingot, which was witnessed by the Board, was effected in 23 minutes. The process of tempering the gun-tubes was also witnessed by the Board. The excavation of the pit is, as at St. Chamond, 15 meters deep, with the furnace at one end and the oil tank (100 tons) at the other. One side of the upright furnace is constructed in the form of a door, which, by a convenient arrangement for swinging, is made to turn on its hinges. Thus, when the tube is raised to the right temperature, it is seized by the traveling crane, the door of the furnace swung open, and the tube at once advanced to the tank in which it is immersed. All tubes are immersed in oil the second time, but at a temperature much below that to which they are raised at the first immersion. This process constitutes the annealing after tempering. The manufacture of steel-armor plates is a specialty of Le Creusot, which is engaged in an active competition with the manufacturers of compound armor. Plates up to 60 centimeters in thickness and 3 meters wide are forged here; they are tempered after forging, but what subsequent treatment they receive was not explained. The tempering pit for the plates consists of an excavation of convenient size, in the center of which is placed a tank containing 180 tons of oil. At the four corners of the pit are furnaces in which the plates are raised to a proper temperature. When sufficiently heated, a plate is seized by a walking crane and immersed in the oil. Hoops for cannon are manufactured here in large quantities. They are cut from solid ingots, and those for guns up to 24 centimeters are rolled like railway tires; those for larger calibers are forged on a mandrel. Jackets of large size are also manufactured; these are made from solid ingots, which, after being forged, are bored out. At Le Creusot a remarkable test of hoops was witnessed, which exemplifies not only the excellence of the manufacture of the steel but also the exacting character of the French requirements. The hoops for naval guns are made with the interior surface slightly conical. When forged, turned, and brought under a hammer, a standard mandrel of steel, conically shaped to suit the form of the cone in the hoop, but of a slightly increased diameter, is introduced, the smaller end of the mandrel being able to enter the larger end of the hoop. The mandrel is then forced in by the hammer until its lower edge has passed through the hoop. The blows are then made to operate on the upper edge, detaching it from the mandrel. Careful measurements are taken of the diameter of the hoop before and after this test, and it is required that the measurement subsequent to the operation shall show that the hoop has partially, but not entirely, returned to the diameter that it had before the entrance of the mandrel. This would show that there is left to the metal a small margin within its elastic limit. A system of manufacture which can comply with such a refinement of exactitude must be very precise. One 100 ton hammer with a fall of 5 meters. One 40 ton hammer with a fall of 3 meters. One 15 ton hammer with a fall of 3 meters. Two 10 ton hammers with a fall of 2½ meters. One 8 ton hammer with a fall of 2½ meters. As the 100 ton hammer at these works is the largest in the world, some particulars concerning it will be appropriate. The foundations are composed of a mass of masonry laid in cement resting on bed rock, which occurs at a depth of 11 meters, an anvil block of cast iron, and a filling-in of oak timber designed to diminish by its elasticity the vibrations resulting from the blows of the hammer. The masonry foundation presents a cube of 600 meters. Its upper surface is covered with a layer of oak about one meter in thickness, placed horizontally, on which rests the anvil block. At the Perm foundry in Russia the anvil block for the 50 ton hammer is made in one piece, moulded and cast on the spot it was intended to occupy. Its weight is 622 tons. At Le Creusot, however, this idea was not approved, and it was determined to construct the block in six horizontal courses, each bedded upon plane surfaces. Each course is formed of two castings, except the upper one, a single block, which weighs 120 tons and supports the anvil. Thus formed in 11 pieces, it is 5.6 meters high, 33 square meters at the base, and 7 square meters at the top. Its entire weight is 720 tons. The space between the block and the sides of the masonry in which it rests is filled in solidly with oak. The block is thus independent of the frame of the superstructure. The legs of the frame, inclining toward each other in the form of an A, are secured at their bases to a foundation plate embedded in the masonry. They are hollow, of cast iron, and of rectangular cross section, each leg in two pieces joined midway of their length by flanges and bolts. The legs are also bound together by four plates of wrought iron, which, at the same time, holds the guides. The height of the legs is 10.25 meters, and their weight, with the guides, 250 tons. The binding plates weigh together about 25 tons, and the foundation plates 90 tons. The entablature of the frame work weighs 30 tons; on it is placed the steam cylinder, single acting, made in two pieces, each 3 meters long united by flanges and bolts. The diameter of the cylinder is 1.9 meters, giving a surface of 27,345 square centimeters (deducting the section of the rod, which is 36 centimeters in diameter); which, for 5 atmospheres, gives a pressure under the piston of about 140 tons. As the weight of the hammer is 100 tons, it is evident that it can be raised with great velocity. The stroke of the piston in the cylinder is 5 meters. This height of fall, multiplied by the 100,000 kilogrammes of the mass, gives a working force of 500,000 kilogrammeters, or about 1,640 foot tons. The width between the legs is 7.5 meters, and the free height under the cross ties 3 meters, thus providing ample space for maneuvering large masses of metal. The entire height of this colossal structure from the base of the masonry foundation to the upper part of the steam cylinder is 31 meters (102 feet), but notwithstanding this unfavorable condition for stability and the enormous effect resulting from a shock of 500,000 kilogrammeters, everything is so well proportioned that there is but slight vibration. The workman who maneuvers the hammer is placed on a platform on one of the legs, about 3 meters above the floor. He is here protected from the heat reflected from the mass of metal during the operation of forging.